(Ottawa) – A judge today dismissed all charges against thirteen Canadians on trial for protesting the reckless climate change and energy policies of the Harper Government. The judge threw out the case after the Crown presented insufficient evidence that the peaceful demonstration constituted a crime. 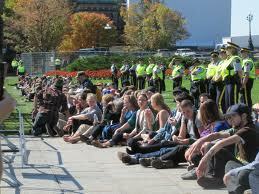 The 13 defendants were arrested on 26 September, 2011, during a demonstration on Parliament Hill in which roughly 200 people risked arrest to protest the climate change and energy policies of the Harper government. 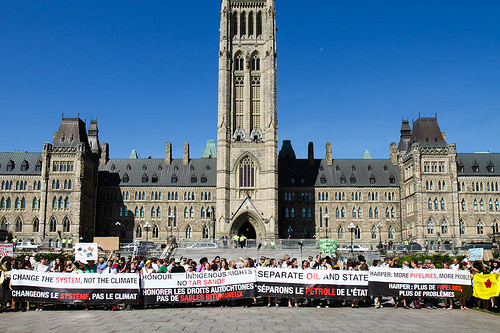 They were charged with engaging in a prohibited activity contrary to the Trespass to Property Act and also issued a trespass notice that banned them from attending Parliament Hill for a period of one year. "I do not regret participating in the pipeline protest last fall. It is our duty as citizens to fight against unjust government policy and stand up for our right to free expression - especially on Parliament Hill."